Yesterday at MWC 2012, Huawei unveiled Huawei Ascend D the ‘World Fastest Smartphone’, today they announced Huawei MediaPad 10 FHD. The MediaPad 10 FHD has 1.5 GHz Quad-Core processor, 10-inch IPS display with 1920 x 1200p resolution, 8 MP rear camera and 1.3 MP front-facing camera. The MediaPad 10 FHD supports HSPA+ 21/42/84 Mbps, Dolby Surround sound technology, 2 GB of RAM and runs on Android 4.0 Ice Cream Sandwich. The Tablet will be available in 8/16/32 GB of Internal Storage and can support Up to 32 GB of microSD card. 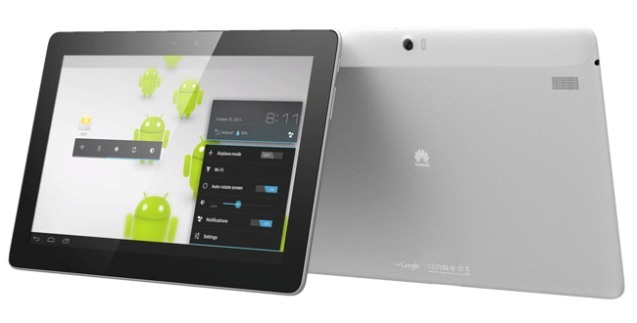 HUAWEI MediaPad 10 FHD will be available for global market in Q2 2012.